Discussion in 'MacBook Pro' started by Rhendera, Aug 7, 2014. Saving up the last few pennies for my first mac - almost there now. Currently I'm using a self-built PC (windows 8.1) and well.. it's driving me up a tree lately. Now I want to use my new macbook as a desktop - do you guys have any advice, can you tell me how you have set it up and which things you would recommend buying? I am using a Dell U2711 - 27" 2560x1400 display and a generic 24" display - which adapters would I need? Next to that I will need a USB hub, I have a lot of USB devices. I use my rMBP as a desktop with no external monitor. For one, there's no room on my desk (I have an old roll-up desk). If you're going to connect the 27" Dell to your MBP, you'll need the MiniDisplay Port to DVI connector. That's it. If you want all of your USB devices connected at once, then yes, you'll need a hub. I also have two hard drives that I will need to connect - any enclosures that are recommended for use? I use mine as a desktop most of the time. Swapping it between work and home. I think its great. I have a Dell U2414H plugged into mine with a mini display port to display port cable. 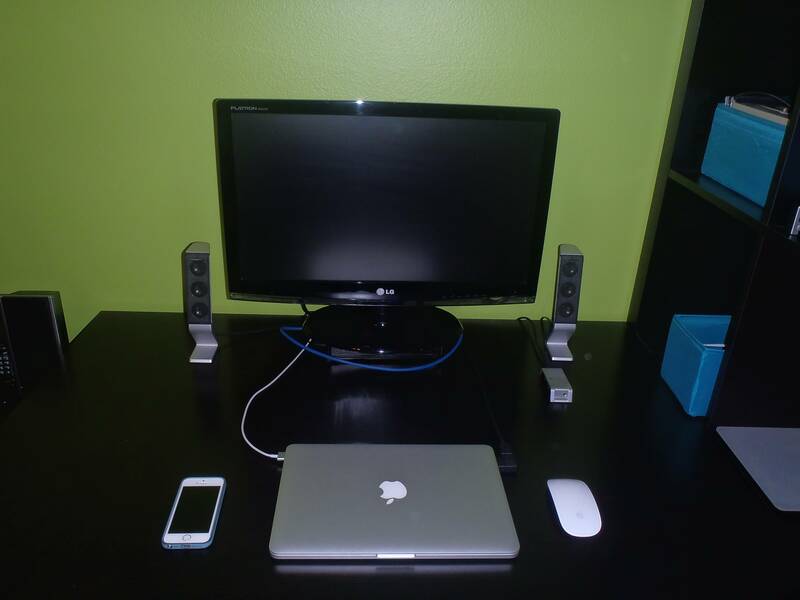 Apple keyboard and trackpad at home and mouse at work. I leave them all switched on all the time and can't say I have to change the batteries too often. I have a 7 port usb hub plugged in and it is inside my desk with 3 external hdd, for backups and media, a dvd drive and a hdd dock. when I come home I plug my magsafe, usb and mini display port and it's ready to go. Awesome! What enclosure do you have for your harddrives? I use mine in clamshell mode with a 23" ACD, full sized keyboard, and a CalDigit thunderbolt station. Only thing plugged into the MBP is the power cable and thunderbolt cable. Unhook those and I'm out the door. Easy to reconnect and resume using a big screen. I have the MBP sitting on its rear hinge in a wooden stand I made to match my desk. That adaptor won't support the resolution of the display. He needs the Mini Displayport to Dual-link DVI connector, which is like $80, though, so that's not the best option. The best and cheapest option, is a Mini DisplayPort to Display port cable. I use one myself for my 27 inch display and it works well. He can probably find one for cheaper than what I linked to, too. Also, as a heads up, don't pay Apple for their $30 adaptors. You can get a MiniDisplayport to DVI adaptor for $3 on Amazon, and it works just as well. I used one for 4 years without any issue. Which exactly model is your Macbook? I use a USB3 hub for connecting an external SSD, keyboard and mouse. My phone charger is connected on the second USB port. For ethernet, I use a Thunderbol Gigabit adapter from Apple and I use a 1080p external display connected through a Mini DisplayPort to DVI adapter. There is a lot of wires crossing my desk, but I think it's the only way to not being stolen by these thunderbolt dock manufacturers. Don't kill your battery ! One more thing - if you use your MBP almost all the time as a desktop, and very rarely take it on the road, you can kill the battery. There is a thread on this on the Apple support page. After about a year without discharging the battery at all, I took it on the road and found it would only last maybe 20 minutes on a charge! In a nutshell, you need to drain the battery at least once a month to keep it "healthy". So, I have a calendar entry to make sure I do that. Cost me $100 to replace the battery myself ( at least it was very easy to do ). Been doing the once-a-month drain for about a year now, seems to be working fine. Every month when I drain it, it lasts ~4 hours with the "energy saver" settings set to never turn off. Awesome! I think you just saved me a lot of money. @brdeveloper: I'm planning on buying the mid 2014 2.5ghz model - Don't actually own it yet. @mrg1 thanks for the info! Going to do the exact same! I do have a question about settings. I have the same 27 inch you have, but whenever I play videos or in general have some kind of graphics going on, the monitor tends to do a small blue highlight across the monitor. Not sure exactly WHY or what to do. Does anyone have any input on this? What kind of profile settings should I look for? 4K @ 60Hz is just plain eyegasm!! My 15" is now in clamshell mode with that monitor + Apple's BT keyboard and mouse. I also have a HDMI to DVI connection from that monitor to my Windows Desktop. I either switch sources [ HDMI <-> DisplayPort ] or use PIP. 4K @ 60Hz is only available via DisplayPort. I could either switch sources [ HDMI -> DisplayPort ] or use PIP. You are using 750m right? Do you happen to get a blue highlight across any videos played? I tend to get that with my dell U2713HM 27-Inch and so I'm not sure what to do. Noob question... will my monitor be able to run 4k? or what are we talking about here? You have me all confused, haha. So far I'm planning on purchasing the Rain Design mStand with swivel base - I'm counting the days until the next paycheck.. I'm so impatient! has to be a 4K monitor.. Yes, 750m and no problems at all.. That Dell unit is a good monitor.. did you try a different cable ? Sorry.. but yes a 4K monitor is required, first and foremost. No, you shouldn't need this at all. I have the same Dell 27" 1440p display and it runs all day with either my 2013 MBA or my new 2014 Retina MacBook Pro with the standard adapter. Also runs perfect with a display port cable plugged into the Thunderbolt adapter (I just picked up a dedicated cable to drop the adapter). Don't waste money on that adapter if it's not needed. I just make sure to unplug the charge cable every other week or so and run it on battery every once in a while. I love having my desktop wherever I need it and it's much nicer than going to my "other" computer (which may or may not have the same files as my main desktop) when I want portability. the 750M can actually do 3 (2k) monitors + internal, so you should have no trouble with 2 external and the internal going at once. I forgot to mention I use a book arc both at home and at work for holding my macbook. Frees up a bit of desk space. So what cable(s) would I have to get to connect both my 27" and 24"? so many different things have been said ..